See if this sounds familiar: You drag all day, feel completely wiped out at night, and yet much-needed sleep still evades you: You’re so wired that sleep won’t come, or it does but it’s restless, and either way you wake up feeling totally depleted the next morning. Lather, rinse, repeat. These are the hallmarks of adrenal dysfunction, also called adrenal fatigue or adrenal burnout. It occurs when the adrenal glands—which are designed to help us cope with acute stress by producing the stress hormones epinephrine (aka adrenaline) and cortisol—get worn out by unrelenting, chronic stress. The result is chronically low cortisol levels and exhaustion, along with low blood pressure, reproductive function, and body temperature. Which means the number one solution for restoring healthy adrenal function is minimizing stress, says Dr. Rawls. “That involves things like meditating multiple times a day so you can turn off your brain and not think about anything but this given moment—and that’s really hard to do.” Which is why having some extra adrenal support could make all the difference — and that’s where diet and herbs come in to play. “The best diet for restoring healthy adrenal function is a basically healthy one: Plenty of whole foods, fruits and veggies, whole grains, proteins, and healthful fats combined with portion control so you’re not over- or under-eating, which puts added stress on your system,” says Stephanie Clarke, M.S., R.D., cofounder of C&J Nutrition. 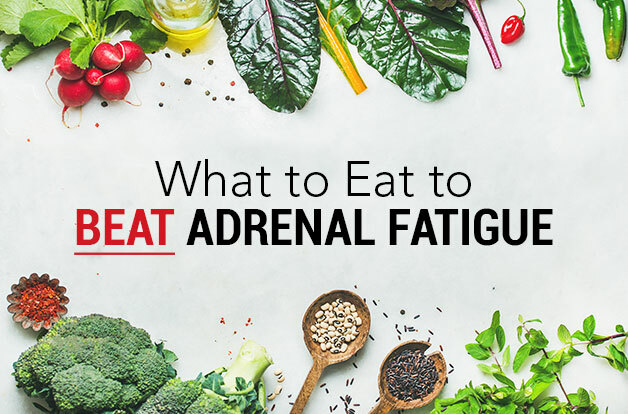 Beyond that, there are some specific foods you can eat to help lift energy during the day and bring on sleep at night, and others you should avoid to take a load off the adrenal glands. Even more important is adding the right natural supplements to your daily routine, which can go a long way in restoring adrenal balance, says Dr. Rawls. Read on to discover what to eat, take, and avoid to help boost your energy levels and overcome adrenal fatigue. This nutrient is key to regulating your body clock and helping you produce the sleep-bringing hormone melatonin. And like all B vitamins, B6 helps your body convert carbohydrates into much-needed energy. Top food sources of vitamin B6 include tuna, salmon, chicken breast, turkey, potatoes, and bananas. The mineral helps convert glucose into energy, and research suggests magnesium deficiency is linked with insomnia, so getting recommended levels (310-320 mg for women; 400-420 mg for men) can help ensure you sleep more soundly at night. Sesame seeds are a great option — they also have fiber and healthy fat, which help stabilize blood sugar levels and prevent energy crashes. Other good sources include almonds, sunflower seeds, pumpkin seeds, flax seeds, cashews, and oatmeal. Kiwi is your go-to here: It’s rich in antioxidants and serotonin, which help you sleep. In fact, eating two kiwis an hour before bed was shown to help people fall asleep faster and stay asleep longer — almost a full hour a night — in a study out of Taipei Medical University in Taiwan. One more reason to jump on the kale-as-superfood bandwagon: The leafy green is rich in calcium, and calcium-deficient diets have been linked with difficulty falling asleep. Other sources of calcium include almonds, sardines, broccoli, bok choy, and of course, dairy. “Some people worry that dairy contains hormones that trigger inflammation and make adrenal fatigue worse, but it’s much less of a concern if you choose grass-fed options,” says Dr. Rawls. If you’re still worried about dairy but craving something creamy, there are always calcium enriched non-dairy milks to try. Your daily calcium goal: 1000-1200 mg.
A diet high in fiber (and low in saturated fat) was linked with deeper, more restorative sleep and fewer mid-night awakenings in a study in the Journal of Clinical Sleep Medicine. Fiber also helps prevent blood sugar spikes that may lower melatonin levels. High-fiber sources include artichokes, whole grains, raspberries, beans, lentils, and peas. Kelp and other seaweeds are high in iodine, which has been shown to help support the adrenal glands and normalize their secretion of hormones in response to stress. Other sea vegetables (nori, dulse, wakame), cod, shrimp, and eggs are also tasty sources of iodine. The goal with herbs is to help get your adrenal cycle back to normal, so that your cortisol levels go back up during the day to help push all your functions, and then calm down during the night to allow for sleep, maintenance, and digestion. Adaptogens are great for this, says Dr. Rawls. “Adaptogens have chemical substances that feed back to the hypothalamus,” Dr. Rawls explains. “Some affect the pathways that generate anabolic, steroidal-like hormones, so they’re energizing; others affect the hypothalamus in a calming way.” He recommends taking energizing adaptogens in the morning; good choices include rhodiola, eleuthero, and panax ginseng. In the evening, opt for calming ones such as cordyceps, reishi and ashwagandha. Licorice contains cortisol-like hormones that have a stimulating effect on the adrenals, but because it’s an herb, it’s more buffering than cortisol, says Dr. Rawls. “It’s good for someone with adrenal fatigue whose cortisol levels are really low, but you don’t want to take it in significant amounts long term or it becomes too stimulating.” He recommends 50-100 mg twice daily, for no more than 1-3 months. This amino acid is found only in green tea and certain mushrooms, and it impacts neurotransmitters in such a way that it brings on calm, focus, and improved mood. “You can take l-theanine most any time for its calming attributes,” says Dr. Rawls; he recommends that people with adrenal fatigue take 200 mg in the morning and again in the evening to assist with easing stress. These herbs are like tonics for the nervous system: They promote calm and restore balance to nerve system functions. Dr. Rawls suggests taking Magnolia Bark (Magnolia officinalis) and Amur Cork Tree (Phellodendron amurense) in the evening to wind down. It’s tempting, we know, but caffeine will only make things worse: The stimulant can increase cortisol secretion, according to findings in the journal Psychosomatic Medicine, which means it’s making your adrenal glands work that much harder—and wearing them out even more. For a better energy boost, revisit the “Fill Up On These Key Nutrients” section, above. Cortisol and adrenaline are best known as stress hormones, but they also play a major role in regulating blood sugar levels. So when you eat processed foods—which are typically high in refined carbohydrates and added sugars (think: cookies, crackers, cereal, doughnuts, and snack bars)—your blood sugar rises, and you’re asking your adrenals to kick in again to help balance those levels. Another case of more demand leading to more fatigue. Overcoming adrenal fatigue isn’t easy, but it is possible, and the good news is the power to feel better is in your hands. Remember that letting go of stress in your life is step one, so be sure to make time for yourself every day.